Logging was difficult and often dangerous work during the first half of the 20th century, yet workers received some of the lowest wages in Newfoundland and Labrador. From sunrise until sunset, loggers felled trees, hauled logs, and helped bring the wood to the mill site. In the evenings, they returned to dirty, drafty, and overcrowded bunkhouses. Many men spent between five and nine months in these camps, separated from their families. Although the food was plentiful, it was monotonous and many loggers became malnourished. Most loggers spent between five and nine months in the woods, where they worked 10-hour days felling trees and bringing wood to the mill site. Photographer unknown. Reproduced by the permission of the Maritime History Archive (PF-107.001), Memorial University of Newfoundland, St. John's, NL. Work-related injuries were also not uncommon because of the physical nature of logging work. Chainsaws, trucks, and other mechanized equipment did not become widespread in Newfoundland and Labrador woods until the 1950s. Until then, loggers manually harvested lumber with axes and bucksaws, and hauled heavy logs out of the woods with horse-drawn sleds. Although logging was much more physically demanding than most other jobs, woods workers did not earn wages for any time off due to injury or exhaustion. Work in the woods was highly labour intensive and paper companies employed up to 9,000 loggers each year. Although most logging operations took place in central and western Newfoundland, the area's small population could not produce enough workers to satisfy the need. Instead, many men travelled to logging camps from the island's numerous coastal communities. Most were seasonal workers who cut wood in the fall and winter before returning home to fish in the summer. These men often had to travel for kilometers before reaching a logging camp; many journeyed by foot and all had to carry their own clothes, bedding, and other belongings in heavy backpacks weighing up to 25 kilograms. Although work was often readily available in the woods, not all men were guaranteed a job once they arrived. 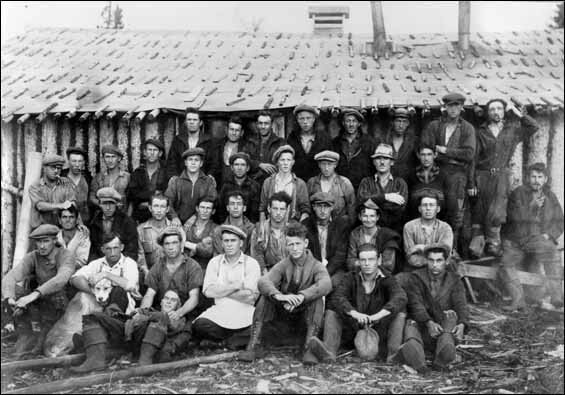 A foreman at Lomond, on the west coast, reported that during the 1930s he sometimes had to turn away workers who travelled there from up to 200 kilometres away. Loggers who did obtain employment worked for contractors, who in turn worked for paper companies. During the first half of the 20th century, the Corner Brook and Grand Falls paper mills were the country's largest employers of woods workers. Each season, the companies paid the contractor a fixed sum of money to harvest a specified amount of wood on company land. From this, the contractor had to pay himself, run the camps, feed the loggers, and provide them with shelter. Often, the company did not pay the contractor enough money to both earn a profit and adequately provide for all of the loggers' needs. As a result, many contractors tried to increase their own earnings by spending as little as possible on the loggers' food and housing. This often resulted in poor working conditions. Bunkhouses were dirty and drafty, the roofs often leaked, and there were only a handful of washbasins and outdoor toilets for dozens of men. Privacy was virtually nonexistent as each bunkhouse had to accommodate between 20 and 100 workers. If a logger wanted a mattress for his bed, he had to rent one from the company for 25 cents a month. These, however, were often dirty and many men preferred to make their own bedding out of tree boughs. To generate extra warmth on cold winter nights, some loggers also slept two to a bed. Although the cook and his assistants prepared plenty of food for loggers, there was not much variety. Beans, for example, were often served at both breakfast and lunch. Other staples included bread, fish, salt beef or pork, pea soup, porridge, and tea. Aside from apples, potatoes, and turnips, fruit and vegetables were scarce. Desserts were also rare, although the cook sometimes baked dark cake or apple pie. Loggers often had to bring their own lunches into the woods, but sometimes the camp had a midday meal delivered. Photographer unknown. Reproduced by the permission of the Maritime History Archive (PF-310.03.02.001), Memorial University of Newfoundland, St. John's, NL. Some camp operators were the exception to the rule. The developer Harry Crowe, for example, who first became involved in the Newfoundland forestry industry in 1902, enjoyed a good reputation for providing better working and living conditions in logging camps under his direction. Crowe originally operated camps in the vicinity of Botwood and Point Leamington. However, in 1923 he founded a model logging community at Hampden, White Bay. Crowe provided housing to families as well as to single loggers, and gave Hampden's residents medical, educational, and sanitary facilities that were unheard of for loggers at the time. Crowe's treatment of loggers earned him the admiration of the Fishermen's Protective Union, which was attempting to represent loggers at the time. Newfoundland and Labrador loggers usually harvested spruce and fir trees for manufacture into newsprint. They did this in three phases over a nine-month period: first was the cutting phase in the fall and early winter; followed by the mid-winter haul-off, when loggers transported pulpwood to a pond or river; and the spring river drive, which brought the wood to the mill site. The cutting phase was the longest and employed the most men. Once workers arrived at a camp, the contractor or foreman assigned them a section of land to work on, which usually measured about 100 metres wide and two kilometres long. Loggers referred to these lots as ‘chances' because they did not know what quality of timber would be in their assigned area. Poor chances could be located on boggy or steep terrain, or contain wood that was difficult to harvest. The quality of a logger's chance directly impacted the amount of money he earned because companies paid loggers by the cord, not by the hour. It was the practice of most contractors to give the worst chances to the least experienced woodsmen. Most loggers worked 10-hour days, six days a week. Early each morning, they walked from the camp to their chances, which could take up to an hour. Once there, loggers felled as many trees as possible using an axe and bucksaw. They removed all limbs from the trees and cut (or bucked) the wood into four-foot logs. Some men removed the bark as well because companies paid more for peeled wood. It was the goal of most loggers to harvest about 1.25 cords of wood each day. Once or twice a month, a company employee known as a scaler measured how many cords of wood each logger cut. This gave the scalers tremendous power because their calculations determined how much money loggers could earn. Many loggers believed scalers underestimated the number of cords harvested to save the company money and to protect their own jobs. Throughout the first half of the 20th century, companies paid varying amounts of money for pulpwood. In 1926, loggers earned between $2.30 and $2.50 per cord; that price dropped to between $1.34 and $1.45 during the Great Depression. As prices dropped throughout the 1930s, many loggers grew increasingly discontent and some stopped working to protest low wages. In 1934, the Commission of Government appointed lawyer F. Gordon Bradley to conduct an inquiry into the logging camps. In his report, Bradley stated loggers were underpaid and overworked. He recommended that paper companies increase loggers' net monthly income from $20.25 to $50. Government officials, however, feared the report would anger paper companies and spark a loggers' strike. They instead asked the companies to pay loggers at least $25 a month in return for not publicizing the report. By early December, most loggers had completed the cutting phase and returned home for a brief period of rest until the haul-off began in early January. Contractors called back only the most experienced loggers for this work, which required about half as many workers as the cutting phase. They also acquired horses to help with the hauling and occasionally had to import Canadian animals, which were stronger than those native to Newfoundland and Labrador. Loggers were assigned to one of four different tasks during the haul-off. 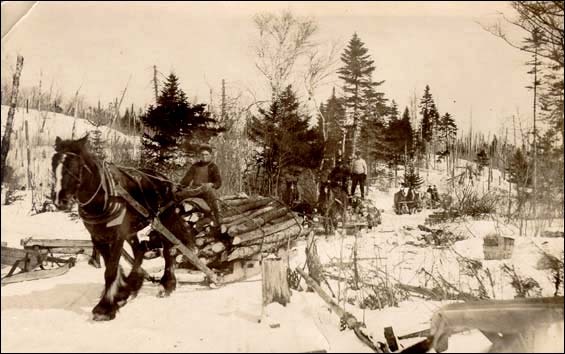 Loaders helped pile the wood onto a horse-drawn sled; teamsters drove the sled to the bank of a river or pond and also took care of the horses; roadmen cleared the roads of any stumps, rocks, or debris that could inhibit the sled's progress; and landers unloaded the logs onto the pond and river banks. During the first half of the 20th century, Newfoundland and Labrador loggers hauled wood by horse-drawn sled. Photographer unknown. Reproduced by the permission of the Maritime History Archive (PF-310.03.01.001), Memorial University of Newfoundland, St. John's, NL. Teamsters had the longest working day. At five o'clock every morning they had to get up and feed the horses. After breakfast, they began hauling wood from the cutting site to the pond or river until about six o'clock at night, with a mid-day break for lunch. When they returned to camp, the teamsters still had to feed and groom their horses. Most men did not stop working until eight o'clock at night. Although they did not haul wood on Sundays, teamsters still had to care for their horses without getting paid. The haul-off usually lasted from early January until mid-March, when the snow became too soft to support the heavy sleds. Once again, the men returned home to spend time with their families and to wait for the river drive to begin in the spring. This phase required even fewer men than the haul-off and the contractor again called back only the most experienced loggers. Once all the ice broke up in a river or pond, the final phase of the logging operation began. Known as the river drive, the purpose of this phase was to float the pulpwood over water to the mill site or railway depot. 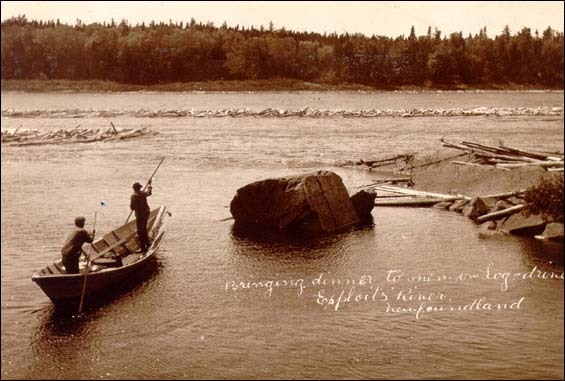 Before the wood was rolled into the river or pond, however, loggers had to clear the waterway of any rocks or other obstructions that could trap the logs or slow their progress. They also built dams and other structures to build up the water's level and quicken its pace. The purpose of the river drive was to float pulpwood to the mill site or railway depot. Photographer unknown. Reproduced by the permission of the Maritime History Archive (PF-310.03.02.004), Memorial University of Newfoundland, St. John's, NL. As with the haul-off, workers in the river drive assumed specific roles. 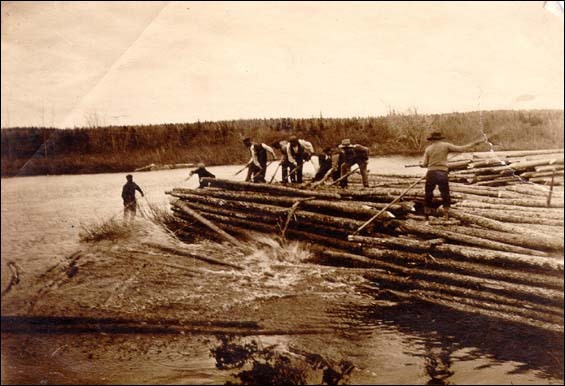 Rollers pushed the pulpwood off the banks and into the water; drivers used pike-poles (long staffs with an iron spike at one end) to guide the logs along the river and toward their final destination; and sackers looked for any stray logs that became separated from the main drive and guided them down the river. Driving was difficult work. The men were wet most of the time and often worked 13-hour days. Once the river drive was over, they returned home for the summer until the cutting phase began next fall. It was only the men who participated in all three phases of the logging operation who were considered full-time loggers. Although they received the most money, they also had to spend up to nine months away from their homes and families. For other related articles view the Forest Industries section of the Economy Table of Contents.